Some drivers describe it as their vehicle pulling or drifting to one side like it has a mind of its own. Often it’s a subtle tug, but it’s enough to let you know something is definitely wrong with your steering components or your vehicle’s alignment. Why is your car pulling or drifting? When your vehicle is aligned, it’s parallel to the road and you enjoy optimum control, handling and comfort. Unfortunately, it doesn’t take much to knock your vehicle out of alignment. Hitting potholes and curbs, and even everyday driving over time can lead to misalignment—and your vehicle pulling to one side. Learn more in our post Why Is Vehicle Alignment So Important? If you’re driving down a straight road and your vehicle really pulls to the right or left, there’s a good chance the cause is more than a misalignment. In this case, you may have worn tie rods and ball joints. 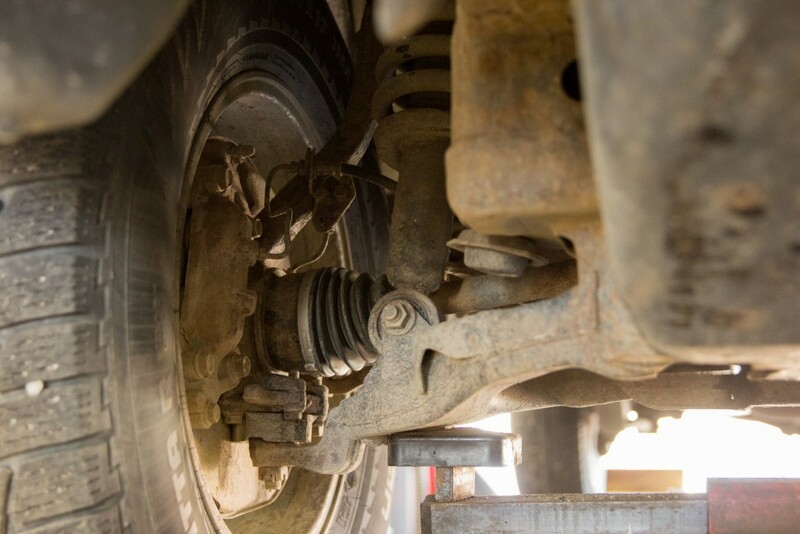 Your vehicle’s steering system uses tie rods—and the ball joints that connect them to your wheels—to turn your wheels in the direction you want to go. Over time, and in the absence of regular inspections, these components can become loose or worn. What can happen if you let a steering or alignment issue go unrepaired? Compromised steering. The pulling and drifting, and lack of steering control, can get worse over time. The risk of the wheels separating from the vehicle, in the case of loose tie rods and ball joints. This could be you and the people in vehicles around you in serious danger. Of course, as soon as you notice your car pulling or drifting, be sure to bring it in to a service centre for a professional inspection. How can you help avoid your car pulling from misalignment or damaged tie rods and ball joints? No one wants to risk losing steering control or risking wheel separation. To help avoid even getting to the stage where your car is pulling, have a front-end inspection performed on your vehicle annually. Within just two inspection points, a service technician will be able to see if there’s a potential problem with your tie rods and ball joints, and a computerized alignment check will point to any alignment issues. It’s worth noting that if you have both a misalignment and loose tie rods and ball joints, you’ll need to have both repairs performed. Otherwise, if you have a wheel alignment performed but there’s still excessive play with the tie rods and ball joints, the vehicle will quickly become misaligned again. Think you have a car pulling to one side and want to get it checked out? Talk to Kal! Our certified technicians perform a range of mechanical services to help ensure safe travels. Call or visit one of our Kal Tire locations near you!